International Rectifier Corporation was an American power management technology company manufacturing analog and mixed-signal ICs, advanced circuit devices, integrated power systems, and high-performance integrated components for computing. It is now part of Infineon Technologies. 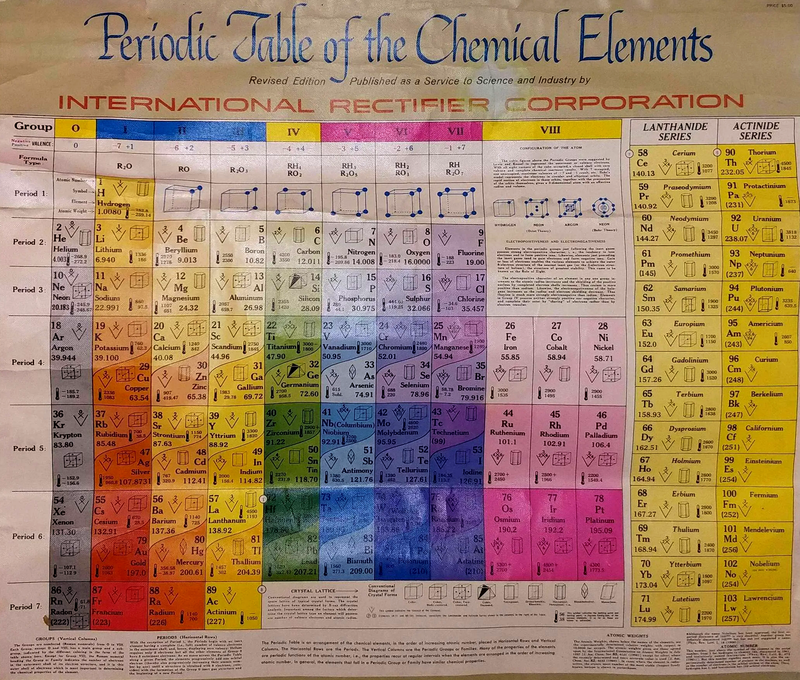 The periodic table below was produced in the late 1950s to early 1960s. The earliest version we can find on the web dates from 1960. Pierre Van Rysselberghe J. Chem. Educ. vol. 12, no. 10, pp. 474—475 1935. "The usual relationships between analogous elements are preserved and are in fact emphasized by this new arrangement. 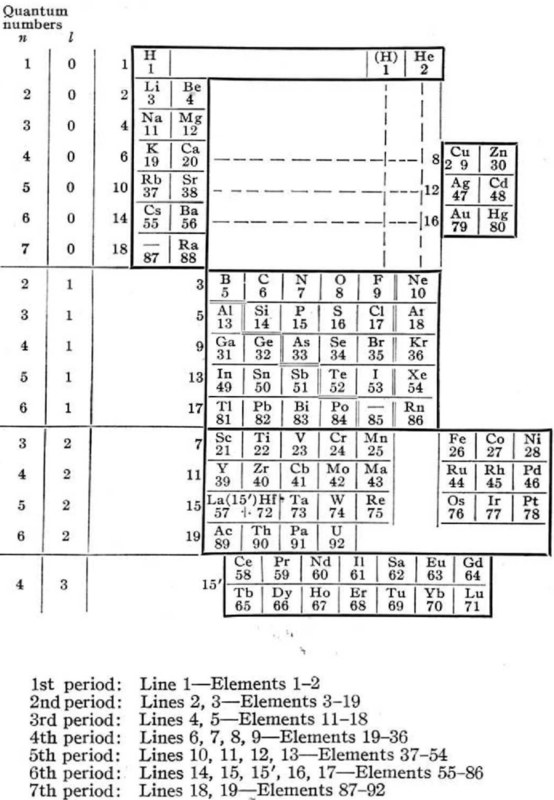 The only missing regularity is the natural succession of atomic, numbers, but all periodic classifications have to sacrifice it on account of the rare earths. Moreover, it can easily be restored by reading the horizontal lines n the order indicated by the numbers written on the left of the heavy frame line. Each horizontal line is limited by the frame of the table. For instance, K and Ca on the one hand, Cu and Zn on the other hand, form two distinct horizontal lines, as shown by the different numbers given to these groups. They are at the same level because the valence electrons have the same quantum numbers." 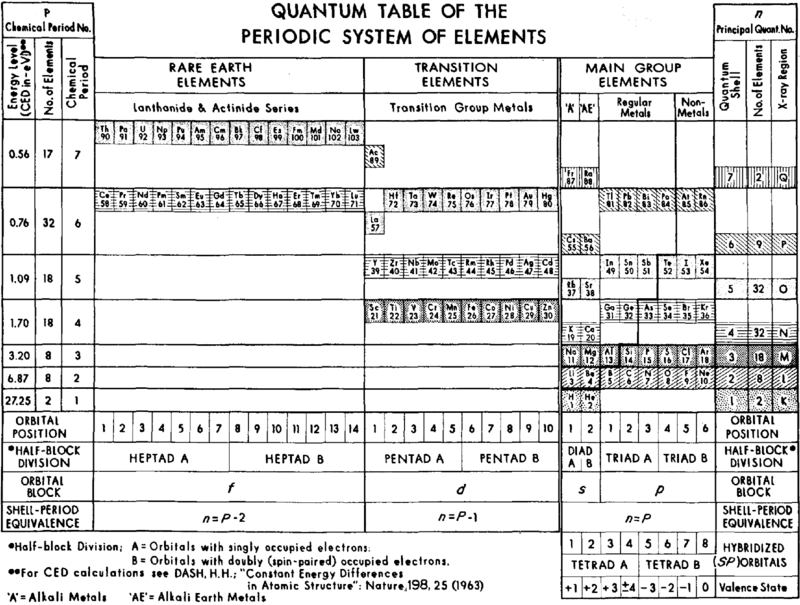 Harriman H. Dash, A quantum table of the periodic system of elements, International Journal of Quantum Chemistry, vol. 3, no. S3A, supplement: Proceedings of the International Symposium on Atomic, Molecular, and Solid?state Theory and Quantum Biology, 13/18 January 1969, pp. 335–340. 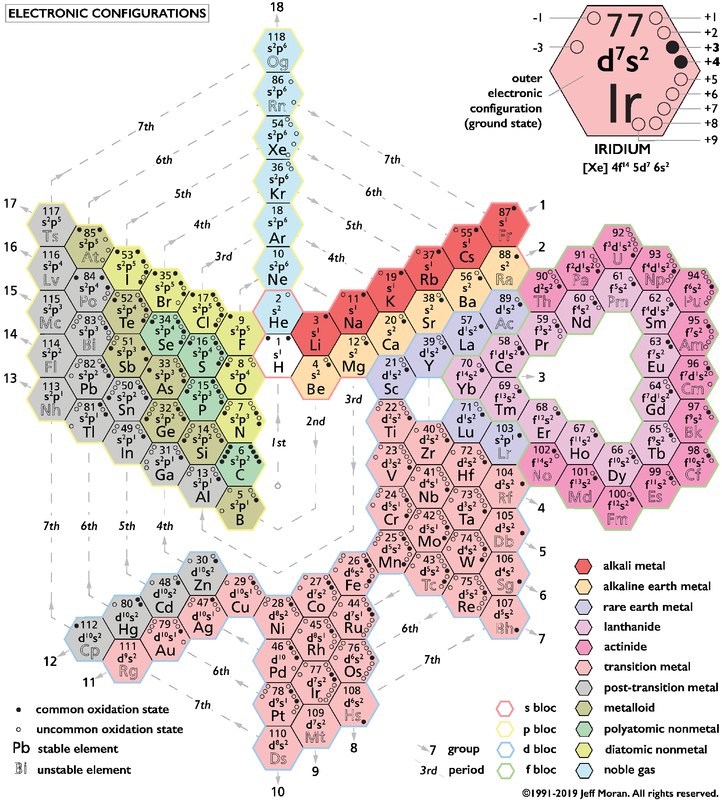 "The shortcomings of the long form of the periodic table of the chemical elements and the evident need for updating this format are briefly reviewed. To the question 'what format?' quantum physics provides an unequivocal answer. The foundations for the design of a quantum table are outlined. These are based on the principal quantum number as derived from the Schroedinger wave equation, the law of second order constant energy differences, and the coulomb–momentum interaction. 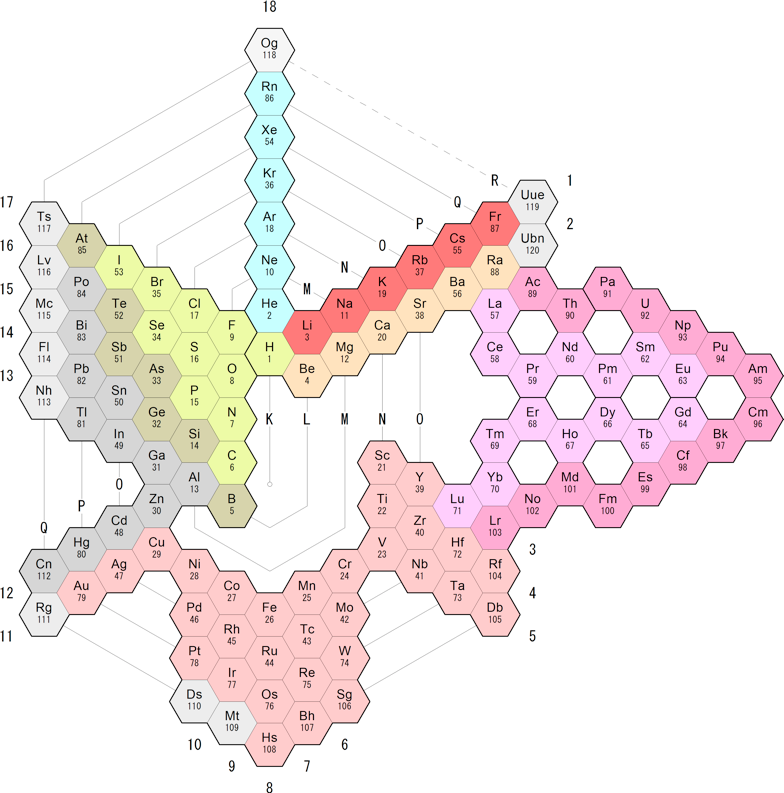 These concepts are all combined into a single format which optimally and explicitly relates periodicity to atomic structure and the physical, chemical, and biological properties of the elements. This relationship emphasizes the unity and universality of all sciences." 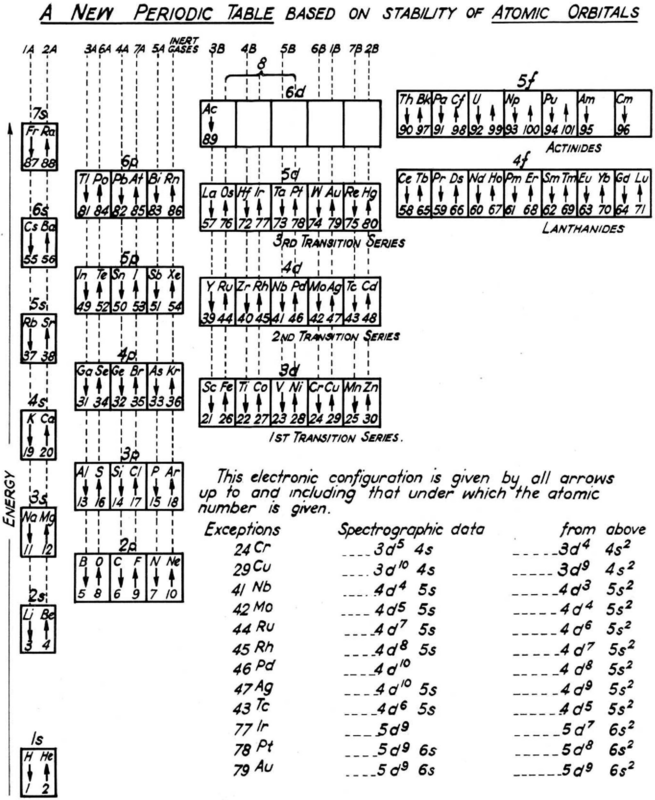 By W. R. Walker and G. C. Curthoys, A new periodic table based on the energy sequence of atomic orbitals, J. Chem. Educ., 1956, 33 (2), p 69. 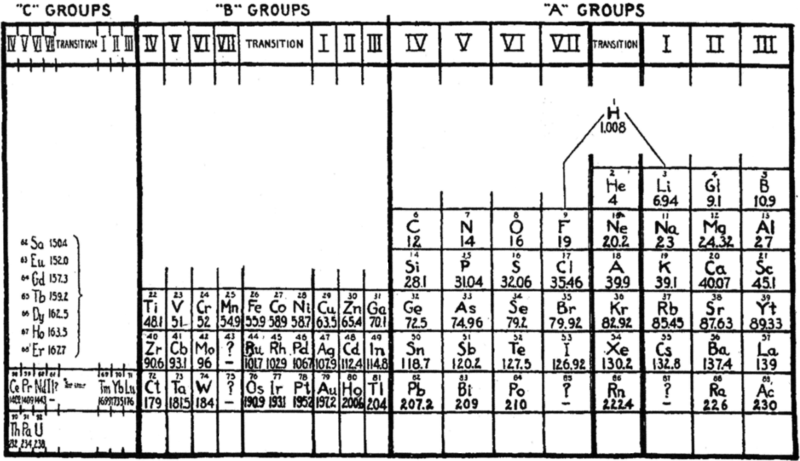 "Since the theory of atomic and molecular orbitals has proven to be of such value in interpreting the data of inorganic chemistry, it is hoped that a new periodic table based on the energy sequence of atomic orbitals will be an aid to the further systematizing of chemical knowledge."